The Cobalt Lofts is a 10 story contemporary designed loft development in the heart of the St. Anthony Main/NE Minneapolis. This is definitely one of the more popular buildings and locations in Minneapolis, and units tend sell quickly, and for good reason. Floor to ceiling glass, hardwood floors, concrete ceilings and exposed duct work are typical in the Cobalt. With a great central location, live in, and walk to most anything including restaurants and the University of Minnesota. Prices in the Cobalt range from the mid 200's on up to around 1.5 Million. Downtown Views and southern exposure from the penthouse units are available in one package on this side of the Mississippi River. 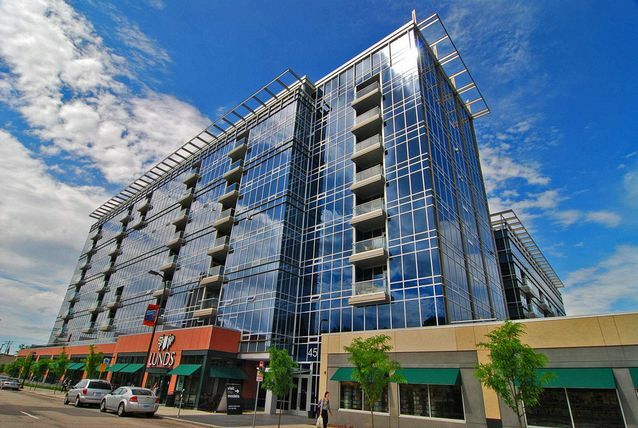 The 107 unit condo building also houses a Lunds Grocery Store on the ground floor. If you like the architecture of the Cobalt condos, a comparable building would be the Zenith Condos in the Mill District or Edgewater in Uptown. See all Cobalt Condominiums for sale below or read more about the building features and neighborhood amenities that make these condos, some of the most sought after residences in Minneapolis. Looking to live at the Cobalt in St. Anthony Main but not finding what you are looking for? Inquire about our 'off MLS' Minneapolis Condo and Loft pocket listings. 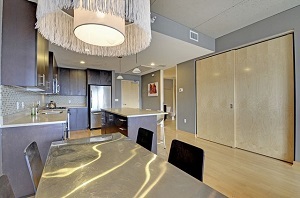 The modern construction of the Cobalt Condominiums offers clean lines and slick contemporary styling. Floor to ceiling windows make for bright interiors with plenty of natural light, and open floor plans add a nice free-flowing feel to the space. 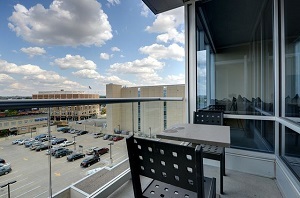 Every unit comes with its own private balcony or terrace, and residents enjoy scenic views from all areas. The shared amenities at Cobalt Condos include a workout room, and a conference room for resident use. Commuters who cycle to work can also take advantage of in-house bike storage. Residents of Cobalt Condominiums live in one of the most lively neighborhoods in Minneapolis: St. Anthony Main. Located just across the river from the Central Business District, and one mile from the University of Minnesota. Close to retail outlets, restaurants, parks, and services, most residents will be able to run daily errands within walking distance. For added convenience, residents can take care of their groceries without ever leaving the Colbalt Condos, with a Lund's right on the ground floor. Parks: Mill Ruins Park, Gold Medal Park, Boom Island, Xcel Energy Water Power Park, Dickman Park, Marcy Park, Minneapolis Sculpture Garden. Restaurants: Vic's Restaurant, Masu Sushi & Robata, The Butcher Block, The Bulldog, Ginger Hop Restaurant, Gorkha Place, Chipolte Mexican Grill, Keegan's Pub, Pizza Nea, Wilde Roast Cafe. Shopping: Lund's, Marshalls, Macy's, Sak's Fifth Avenue OFF 5th, Gaviidae Common, Target, Gopher Grocery, Gap, Office Depot, Rainbow Foods. Schools: DeLaSalle High School (Private, 9-12), Marcy Open Elementary School (public, K-8), New Horizon Academy (private, PK), Bernie's Montessori School (private, PK). 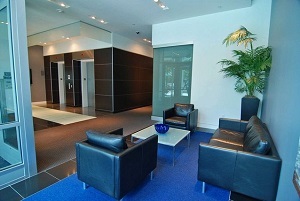 Do you own a condo in the Cobalt and happen to be thinking about selling? Let me assess your condos value and get you a price quote. Fill out my condo sellers form and our team of Minneapolis condo experts at Downtown Resource Group will get back to you with more information on the recent sales activity in your building as well as provide you a marketing plan and general market assessment.